With the wind rattling your windows, the snow blanketing the yard and the cold creeping under doorways, it’s time to get out your winter survival kit. 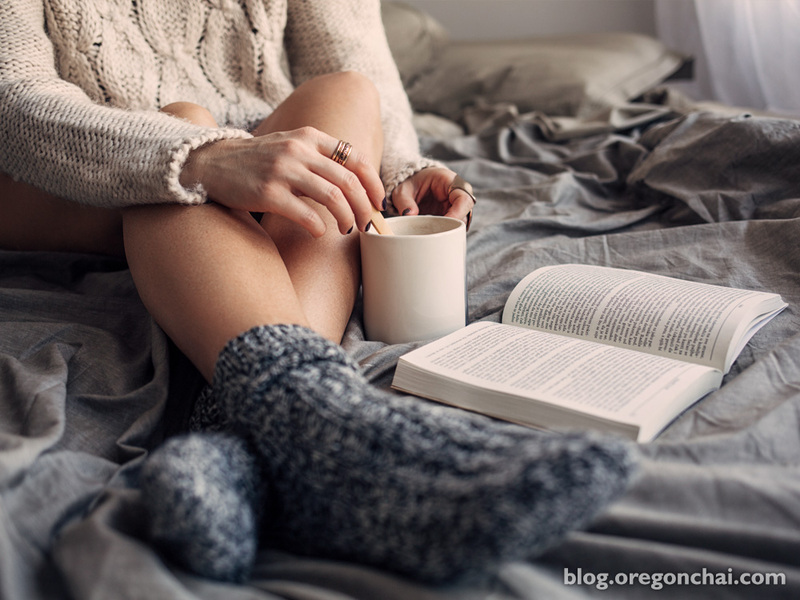 Put on your warmest wool socks, brew a mug of your favorite Oregon Chai tea and settle in under a heap of soft blankets with a good book. Check out some of our favorite books for a night in below. Read the book before, or after, you catch the movie, depending on your style. Still Alice tells the story of a successful professor whose mind slowly deteriorates after her Alzheimer’s diagnosis. Oscar-nominated actress Julianne Moore plays Alice in the film, alongside an all-star cast. Pair this book with our stimulating Energia Herbal Chai Tea Bags to stimulate your senses. While your body may be snuggled up in your house hiding from the cold weather, your mind can still take a vacation. In The Vacationers, the Post family spends two weeks on the Mediterranean island of Mallorca, where family secrets soon come to light. Pair this book with some Caramel Latte Espresso Concentrate for extra indulgence. Settle in for a night of intrigue with this collection of post-modern detective stories. Each novella in the trilogy features a different detective and plot, so you can read them all or choose which best suits your mood. Pair this book with our Caffeine Free Original Chai Tea Latte Concentrate so you won’t be up all night pondering whodunit. The popular movie version of this book released earlier in the year may have you itching to read the memoir that inspired the film. Wild is not only the story of Strayed’s emotional journey to independence but also her physical journey hiking along the Pacific Crest Trail. Pair this book with our Vanilla Chai Tea Latte Mix so you can make an extra large chai—you might be in for a long night. History buffs and nonfiction lovers will love this true story that reads like a thriller about a top-secret intelligence network called the Culper Spy Ring. Washington recruited these spies to infiltrate New York and win the American Revolution. Pair this book about history with our traditional Original Chai Tea Latte Concentrate. This classic tells the story of the Dashwood sisters and their experiences with love and loss. The novel begins with the death of the sisters’ father and their subsequent move to a meager cottage in the south of England. Pair this book with our own take on sense and sensibility, the Slightly Sweet Original Chai Tea Latte Concentrate. I stayed in an airbnb in St Andrews, Scotland. The host said he would be away and that the house might not be so tidy. he was right. The place was filthy. I was unsure which room to sleep in and there was a see through curtain on the window, no bedding. I did have my own sleeping back. I notified airbnb. No response. The host wrote a fairly abrupt response on his site. No action was taken. However, other guests complained about the exact same issues. Five months on and no one has taken any action. An apology would have been nice.